Pico Union Project will host another hybrid shabbat in its historic Sanctuary on Friday, April 15, 2016 at 8pm. 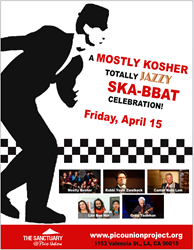 Pico Union Project is excited to announce A Mostly Kosher, Totally Jazzy, Ska-bbat Celebration on Friday, April 15, 2016 from 8pm- 10:30 PM. The evening will feature a Jazz/Cantorial Teaching in Song by Stephen Wise Temple’s Rabbi Yoshi Zweiback and Cantor Nate Lam, as well as the talents of Mostly Kosher, a Los Angeles based indie-global-collective whose music fuses klezmer beats with Rock, Hip-Hop and Folk. The evening will begin with Wine Tasting and Lite Bites set to the music of San Francisco’s Lior Ben Hur, a reggae band that will have you dancing in the aisles. A Mostly Kosher, Totally Jazzy, Ska-bbat Celebration is part of a monthly series of Hybrid Shabbat events which aim to elevate the ancient Jewish teaching to “Love your neighbor as yourself.” Orthodox, atheist or religiously ambiguous, hybrid Shabbat celebrations are a time to explore Jewish faith, culture or history in a safe space.